Walk, peddle, ride above ground, ride underground, or go by boat. It's a relatively compact city, so combining your own two feet with low-cost public transportation is the best way of of getting around in Paris. In fact, it's one of the best walking cities in the world, and it also has one of the best public transportation systems. Have a Metro map with you and you'll never be lost. That's what we do — we walk whenever we can, because there's just so darn much to experience. But, when we need to go farther across the city, or when we're in a hurry, we hop on the Metro or a bus. 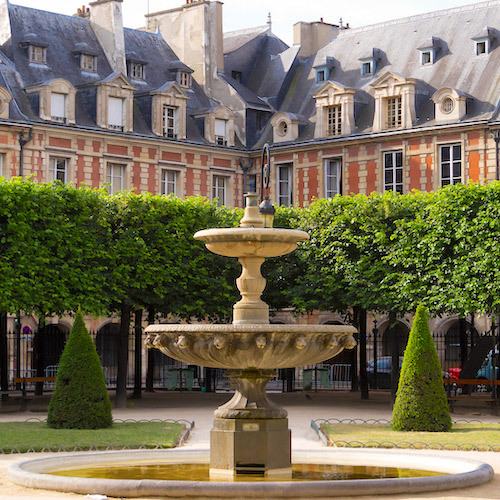 There a lot to see in Paris, and you can walk between museums, monuments and attractions in a matter of minutes! For example, the footbridge from Musée d'Orsay gets you across the river and into the Tuileries Garden in less than five minutes. It's one of the oldest and best subways systems in Europe and the top way for getting around in Paris. 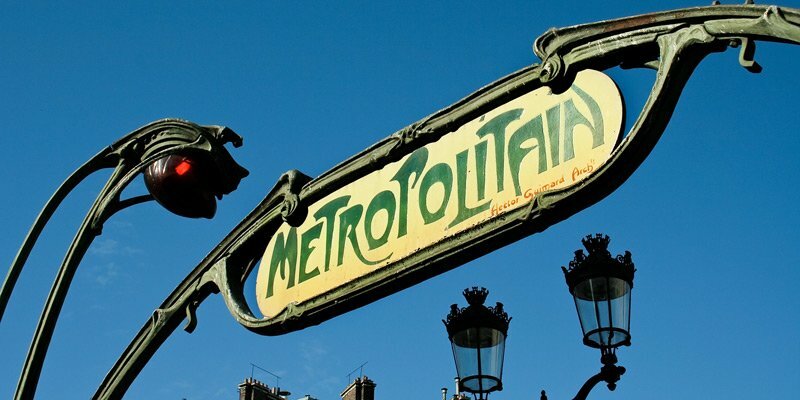 The Paris Metro is convenient, extensive, affordable and safe. 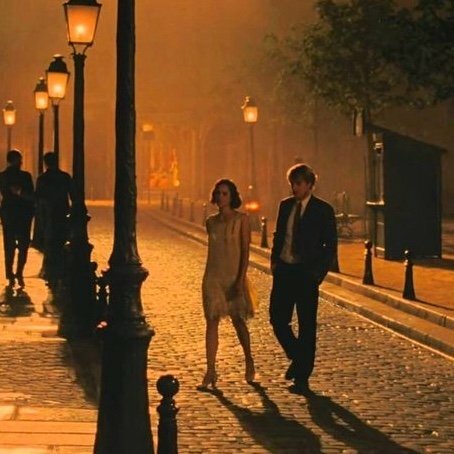 One ticket gets you anywhere in Paris. For you history buffs, the first Metro line was designed by engineer Fulgence Bienvenue and opened in July 1900. Now, 200 kilometers of rail connect 300 stations. Today, a Metro station is within a 9-minute walk of virtually anywhere in Paris. Metro tickets and passes can be used on the Metro, on city buses, on the trams that operate on the edges of the city, and on the RER (the deep underground commuter trains) within the central city. We recommend that you buy a Paris Visite Metro Pass, which is included as part of the Paris Insiders Pass package. That package lets you ride the Metro (and buses, trams, RER) for free, with no limits, and also visit museums for free. 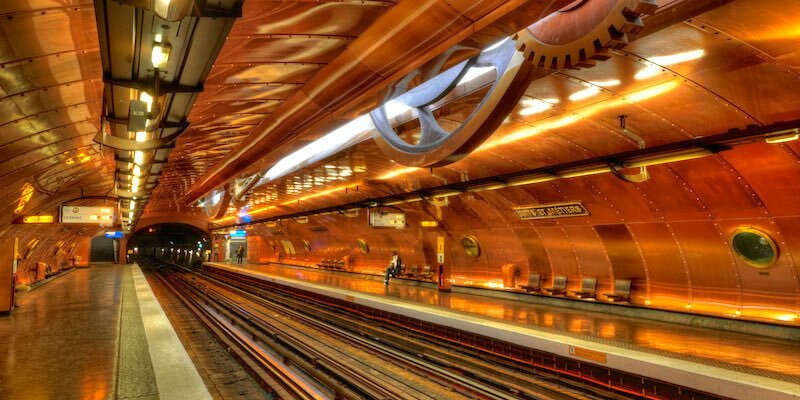 To learn more about the Paris Metro, read our guide. Riding the Metro is efficient, but don't ignore the city bus system. Buses are a wonderful way to travel around Paris while seeing a lot of the city. There are approximately a gazillion bus stops in the city and there will be one very near to your hotel or apartment or anyplace else you happen to be. Each bus stop posts the routes of the buses that stop there. Most of the bus stops have displays that show you when the next bus will arrive. The newer bus stops are pretty high-tech, with interactive maps, photo shows and more. In the daytime, buses usually run from five to seven minutes apart, so even if you miss one, another one will soon arrive. Remember, you can use your Metro ticket or pass on the bus, making it very convenient. 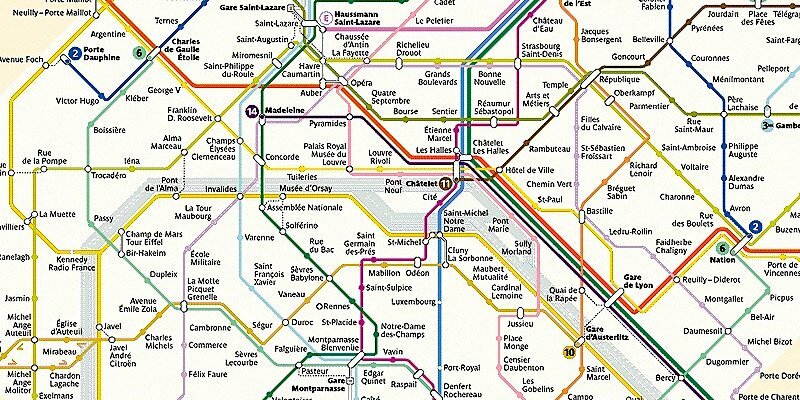 One of the greatest things you find at the RATP website (Régie Autonome des Transports Parisiens, the public transportation authority in Paris) is an interactive route map for the Metro, buses and RER. You can use this to plot the best route from any one point in Paris to another. Enter either the actual street addresses, or enter Metro stops. You can choose whether to travel by Metro or bus, or let them choose the best route for you. You can enter either departure time (right from your hotel or apartment) or arrival time (at your final destination). 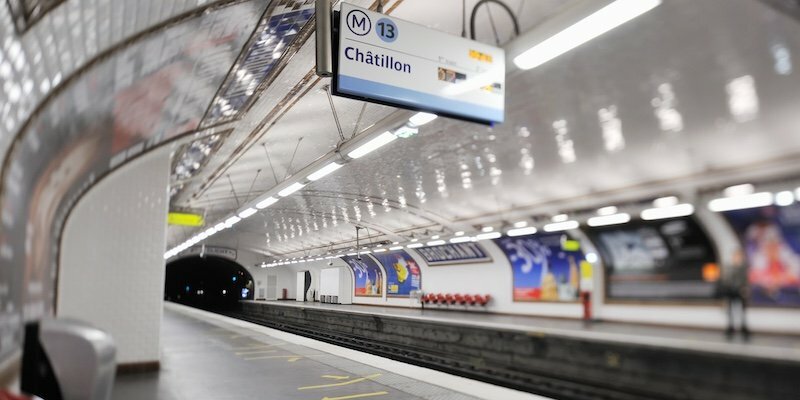 The Paris Metro has been around for 120 years and there are now 14 lines and something like 300 stations in the system, which is one reason the Metro is so convenient. While each the Metro stations has something to offer, there are a handful that are downright interesting. Let's take a ride to these 10 landmark stations. Hector Guimard was an architect and designer whose work spanned the later 19th and early 20th centuries. Although he designed buildings, furniture, and other objets, today he is most well remembered for his entrances on the Paris Metro. He produced a slew of designs for Metro stations right from its inception in 1900. Although many of them were destroyed (sorry, we mean "replaced for progress") in later years; luckily there are dozens extant today. Let's visit them. Do you have your Metro Pass in hand? 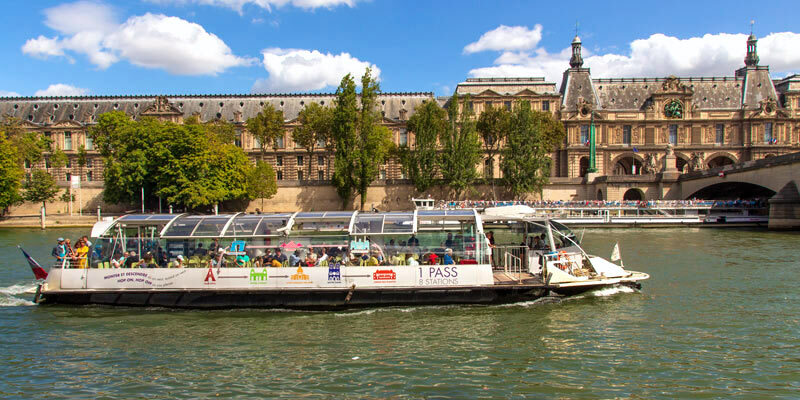 The Batobus is a boat service that runs up and down the Seine from May to the end of September, and it's a fun way to get around in Paris. You have the option to buy a 1-day pass or a 2-day pass, although the best deal is an annual pass, if you like Paris so much that you just can't leave! Paris just keep getting better, and recent changes to the city's transportation system are examples of that. 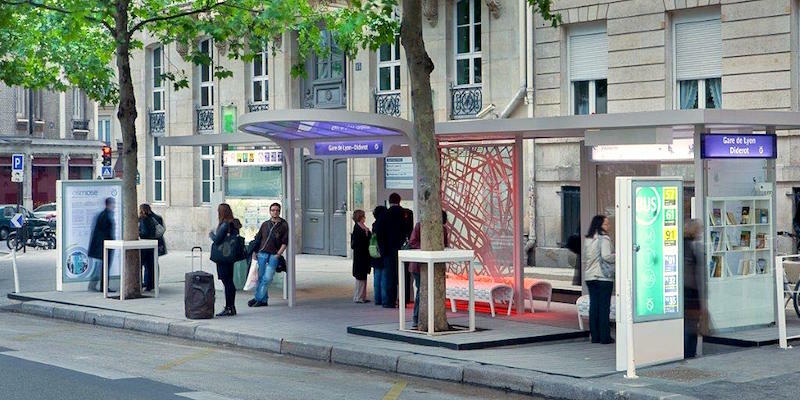 Let's take a look at the new, better buses from the airports, flat-rate taxis, a new name for the old RER, and improvements to the Navigo Metro card. 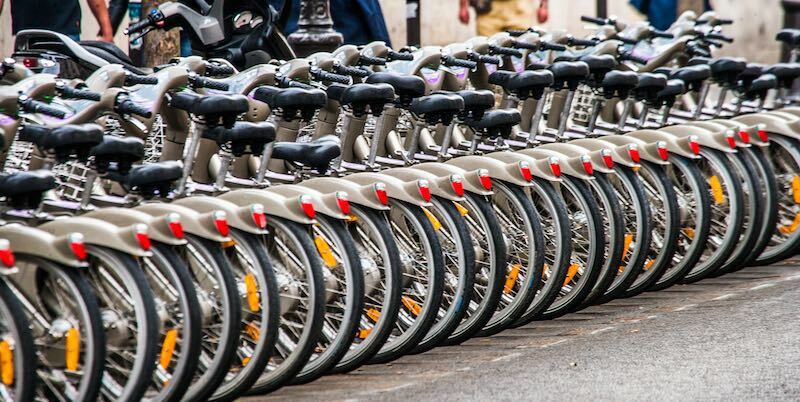 Launched in September of 2007, the Velib (a contraction of the French words velo and libre, or "free bikes") have become a popular way for tourists and locals for getting around Paris. Paris is a relatively flat city, so cycling around the twenty arrondissements is an easy way to travel. (Getting up to Montmartre, though, is demanding.) With nearly 24,000 bicycles available in 1,800 bike stations throughout the city, you'll always find a bicycle to rent. 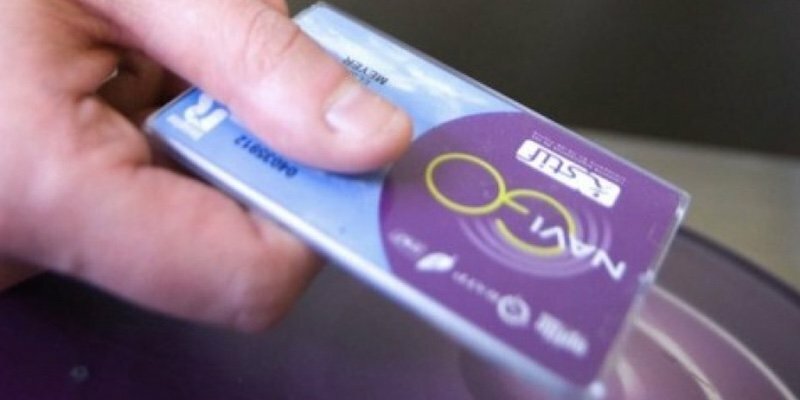 You will need a credit card with a chip to use the Velib. There are almost 16,000 taxis in Paris, and over the past few years it's become easier to find one. You no longer necessarily have to find a designated taxi stand to find a cab. We see people hailing cabs on the street all the time, in fact, we do it ourselves! 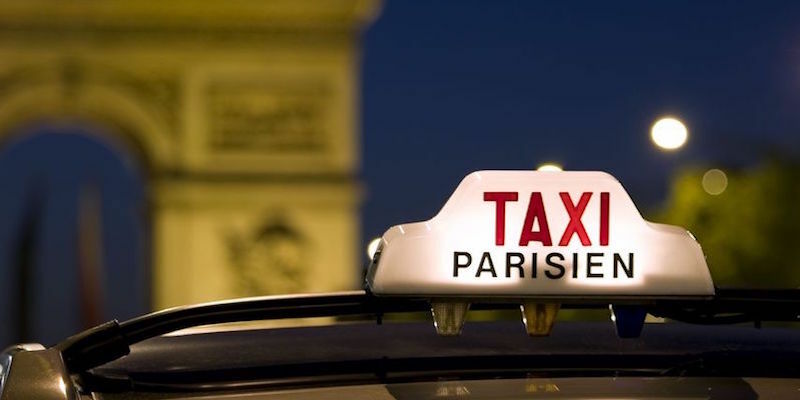 In general, we find Paris taxis to be cleaner and the drivers more professional than in many other cities. Taxis are also one of the most convenient ways to get from the airport to central Paris. The capital of France is the hub of an extensive rail network. 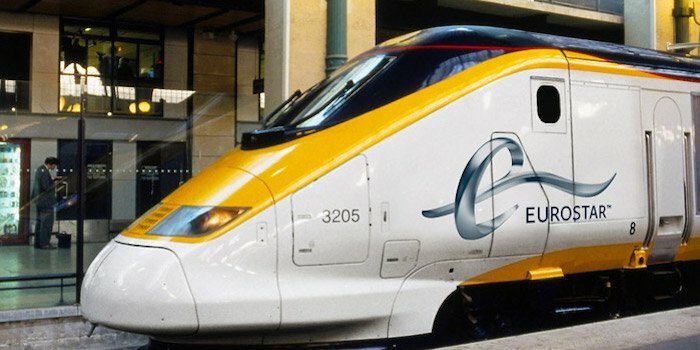 It's very easy to travel from Paris to any of the major cities in Europe, as well as hundred of French cities. And you travel in style, as well, on high-speed trains with frequent departures, in comfortable first and second class cars. Notice we didn't mention cars as a way to travel around Paris? That's for a very good reason. Driving in Paris can be a nightmare and finding a parking space is even worse. Except in the luxury class, there are not many hotels that offer parking for your car. But, not to worry! 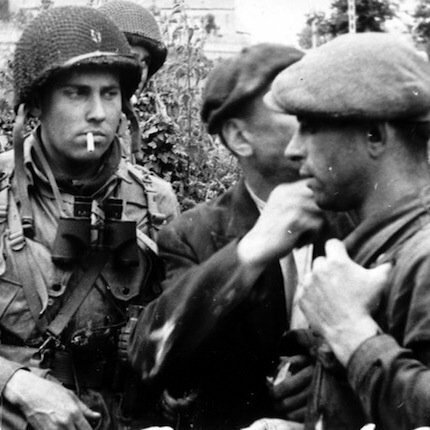 With all the options we've given you in this article, you'll never need a car in Paris. We can't leave the subject without again mentioning walking. Paris is a very walkable city. Not only will you work off some of the calories from those meals you've eaten, you'll also see a lot of wonderful things you can't spot from the Metro or a car!